In the last few games, Denard has had accuracy problems in the passing game, resulting in multiple interception efforts against Michigan State, Illinois, and Purdue. After rewatching each game, it seems as if his mistakes are a combination of both bad reads and poor technique. Never was this more apparent than his first interception against Purdue on Saturday. 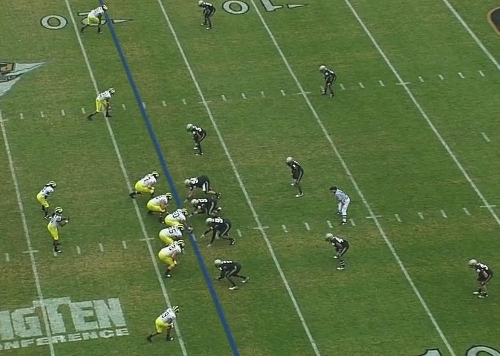 Michigan is in a 4-wide set with Vincent Smith in the backfield next to Denard. Purdue is in a 4-3 front. Michigan was just called for a holding penalty and is put in a 2nd and goal from the 18 yard line. 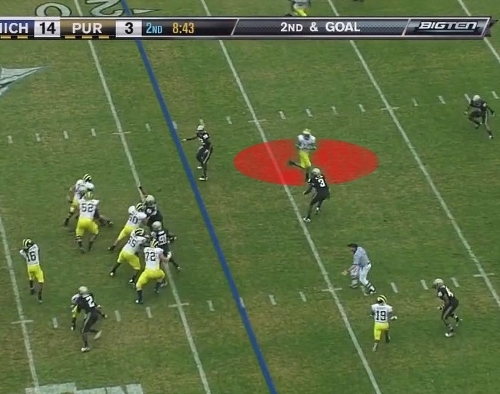 On the snap, Purdue rushes their four down linemen. Smith stays in the backfield to help in pass protection, which Michigan had struggled with all day. Purdue is playing zone coverage with the three linebackers playing underneath zones and the corners and safeties playing quarters coverage over the top. 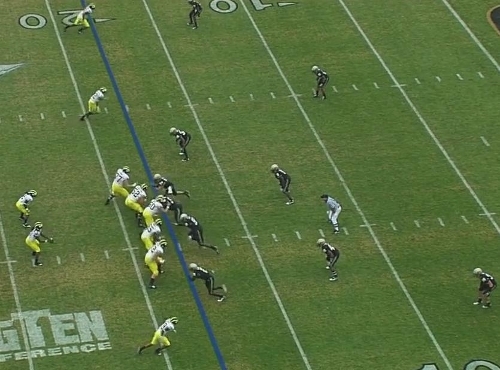 The two receivers to Denard's left are both running slants. 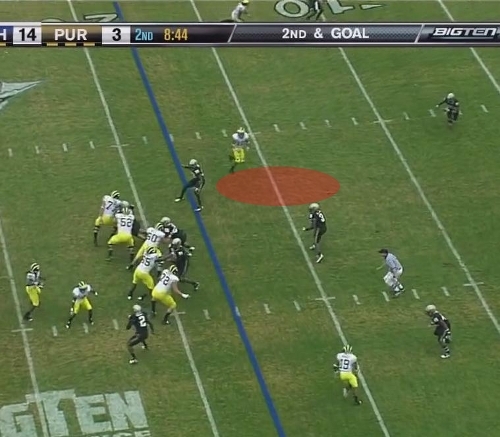 Denard's first read is Roy Roundtree in the slot who is slanting just beyond the underneath defenders. Unfortunately, Denard seemed to lock onto the outside receiver and is staring outside rather than making the proper read to the inside. The area in red is soft spot in the zone that Denard should throw into. 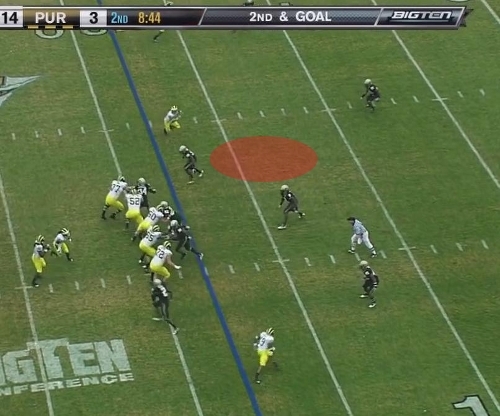 Right now, Denard needs to throw the ball, just before Roundtree crosses into the soft spot in the zone. Unfortunately, he just got his head turned around to his first read and recognizes where he should throw the ball. As you can see, Denard is holding the ball below chest level and won't be able to release the ball quickly enough. I think this is a fundamental problem in Denard's throwing motion: he holds the ball too low and has a wind-up that takes a bit too long. Now, so did Tim Tebow--and we all saw how that turned out--but a higher hold might help get the ball out a little quicker. Denard's issues on many of these throws have been poor reads, not inaccurate passes. This is another instance of what Rodriguez talks about when he says its important that the quarterbacks have their eyes in the right place. On the positive side, this can be fixed. With more time in the system and more time playing in general, these plays will become instinctive. Unfortunately, this play can't be attributed to the awful weather on Saturday. Making the proper read will be crucial if Michigan wants to have any chance against Wisconsin and Ohio State. Looks like the outside receiver is open. If he looks there first and throws to the inside, it doesn't look to me like the safety would be able to get over or the cb would be able to undercut it. Thoughts as to why not to just pull the trigger to the outside WR? In this instance, both receivers are running slant routes, except the outside receiver takes a few vertical steps before breaking the slant (sort of a post, but not quite). This gives Denard time to make his first read and, if it's not there, it should be because his second read (outside receiver) is open. 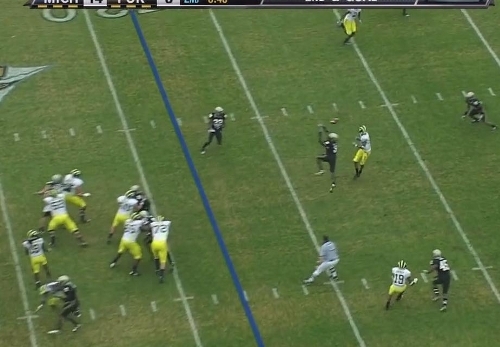 By locking in on the outside receiver off the snap, Denard completely misses his first read. When he gets his eyes in the right place, and realizes his first read is open, it's already too late. Even if he pulls the ball down, the outside receiver will also be covered because of that late read. He can't snap the ball early outside because the WR is taking those vertical steps to get downfield. If he throws the ball too early, the WR won't have gotten out of his break yet and the corner/safety would make a break on the ball. Also, the playside linebacker is reading Denard's eyes and could swat a pass to the outside, which I think is why Denard pulls the ball down in the first place and attempts the pass to Roundtree. I think he seemed to halve it - he missed the timing to Roundtree but started to throw it anyway then he saw Hemingway again. Zone blitz: Proof of defensive... coaching? "Just put points on the board"